Instead of compiling a year-end best-of list, Editor David Vogels asked a hand-selected group (consisting primarily of wine directors, sommeliers and other wine pros) to contribute what they thought to be the most memorable wine they’d tasted in 2009. The only restrictions: the wine had to be available in the U.S., and the contributor shouldn’t be commercially representing the wine in any way. It’s a novel and very entertaining way to recap another year in vino. The result is presented in the December issue as a 40 selection wine list (along with tasting notes), divvied into Sparkling, White, Rose, Red, and Dessert categories. The prices of the chosen wines tells us some interesting things about how wine pros view the wine world. The average price of a wine on that list? And while just over ninety-seven beans might be the average, a cool $100 won’t even get you a bottle of eight of those selections, and all but eleven of the selections are priced over $30. 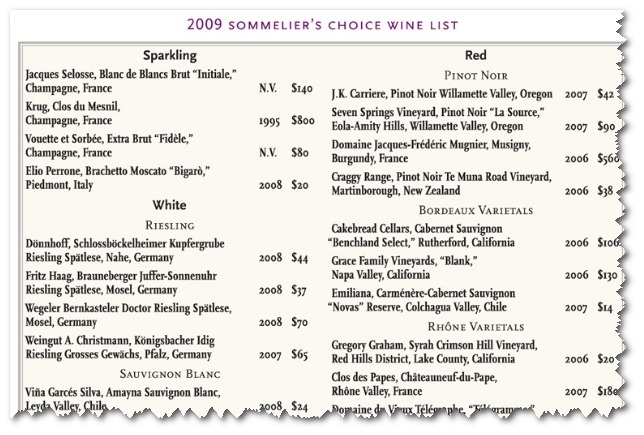 I just don’t see too many people ordering up whole bottles of this wine list in today’s economic climate. To be fair, there are a handful of outliers that are pushing the average way up (in particular a $560 Burgundy, a $500 Tokaji, and an $800 bubbly) – ordering those with a three-course meal would set you back a mere $1860! The largest area of bargains seem to be the whites, where an average price of $41.93 can get you a memorable wine experience. Well, it tells me that while bargain wines are easy to come by, the pros don’t find the experience delivered by those bargains to be all that memorable. Which could be due in part to price bias, but probably is equally influenced by what many people see as the trend of bargain wines to be made to taste like one another – i.e., not unique and therefore, presumably, not very memorable. 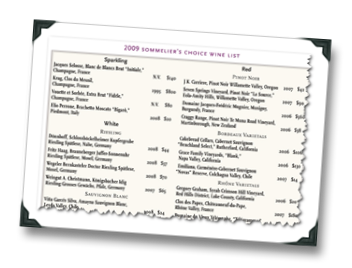 The cheapest selection (at a very affordable $14) was supplied by fellow 2010 Wine Writers Symposium attendee Patricia Savoie – Emiliana’s 2007 Carménère-Cabernet Sauvignon Novas Reserve from Chile. Michael Meagher, the Boston Sommelier Society Chairman, was a homer and selected the local 2007 Westport Rivers Chardonnay, (Massachusetts) at $16. I don’t know about you, but I’d dish out $15 for the `07 Quinta do Crasto Douro red blend, based on Walt Disney World’s Kristie Jones’ description as being able to “satisfy Cabernet fans, Syrah lovers, and Malbec groupies” (sounds like a crowd-pleaser to me). Got a take on memorable wines (cheap or otherwise)? Let’s hear it! Dude – Did you take into consideration that the price skew might be driven by the ego's of some of the individuals involved than any consideration of flavor profiles? Nothin' fer nothin' but allot of these peeps would hardly define themselves by wines that dont reflect thier standing in the supposed wine hierarchies (no matter how much they love a bargain). In fact, many regular folk fall victim to the same thing, though it seems recession may have put a dent in this sort of "drink to impress" behavior. I was thinking exactly what "UnmitigatedGaul" was thinking. But, I'll give these guys and gals the benefit of the doubt. A good sommelier needs to be able to find great wines in any price range. While we "mere mortals" may scoff at a $500 bottle, for many (especially regulars at fine restaurants), that may be run-of-the-mill, and I'm sure- as with $15 bottles- there are $500 ones that overperform and underperform. So, as long as there are good selections in all price ranges, I'm okay with it. And I bid you adieu. Blind squirrel finds an acorn? Since I do know most of the contributors, I think I can say that ego probably didn't play a large role, because I think you actually have it a bit backwards. Professionals aren't overly impressed by the fact that you've had an expensive wine because they have many many more opportunities to taste them then the average Joe. These added opportunities also increase the likelihood of some picking a really expensive wine because they thought it was really good. We didn't mention price at all in our instructions. My take on what impresses professionals is unknown wines or for lack of a better word, esoteric wines. So anyone looking to show off would have picked a wine from a lesser known region or a varietal from a region not known for doing it. That's how you get "street cred" in the professional world. How many wine lists in the world would have 3 Chards (none from California) and 3 Cabs/Bordeaux varietals, and 3 wines from Portugal, none of which are dessert wines? As to why they picked the wines they did, all we have to go on is their statements. The nice thing about asking for the most memorable wine is that everyone attaches a different meaning to the term "memorable." Some clearly went for a more sales angle, some for personal gratification, some for what they know and taste the most often. One thing I didn't really get into in the post was the statements, some of which are very passionate; the entire piece is well worth a read (for those who haven't read the entire thing). I think the key word here is "memorable." Face it, it's really difficult to find something memorable in a wine that sells for $15/btl. The wines in that price range just don't have the complexity to make them memorable. Sure, they can be good, even great wines. But memorable? That's going to be a tough one to pull off. Mine has to be Quilceda Creek Cabernet Sauvignon 2003. It was truly a memorable experience. Extremely complex, with loads of dark fruit, with just enough acidity and earthiness to offset the fruit. It wasn't until AFTER I tried it that I learned that it retails for $100 and got a 100 score from WA. Some truly amazing juice. Totally – I touched on that briefly in the post. What I've found is that it's typically the $30-$50 range where magic can happen and a wine can really shine and over-deliver, sometimes providing as much or more of a memorable experience than wines 3x that price. Which isn't to say that *only* wines in that price range do that, it's just that in my experience that's been the "magic" price range (especially for wines from the new world). How weird! Just yesterday, I posted a review of the '07 Quinta do Crasto: http://notesfromthecellar.com/2010/02/getting-in-… … It really is fantastic! And yet, neither of you apparently saved any for me. Thanks for the post, Dude. Somewhat apropos of the discussion on statistics in the Wine Trials thread, here's my 2 cents on the price part. First, we didn't mention price at all in our instructions and you have to remember that for many of these folks, they get to try the wine without paying for it, so I don't think QPR factors in as much as it would for someone who had to pay for the wine to consume any of it. Whether that is a flaw in the way we constructed this is certainly open for debate. Now, back to stats. You pointed out that there are only 11 wines under $30, or 28% of the total. I could say that there are 22 wines under $50, or 55%, or even better, 23 wines $50 or less, or 57%. So a cool $50 will get you more than half the wines on the list, at retail prices (very important to note this, so a restaurant markup is going to vary, but these prices are not what you'd pay in a restaurant, big point toward prices being "too high''). Now you pointed out the average price is $97.18, the median price, however, is $43.50. So your post could have easily said, the $43.50 wine list and talked about how a cool $50 would have gotten you more than half of the wines on the list, despite the presence of some really high-priced wines. I'm not trying to bust on you too much here, as your post is also accurate, the average price is nearly $100 and there are 11 wines less that are less than $30. You also didn't go for the retail/restaurant angle, which could have driven your point home even farther. But the complete statistical picture is that this "list" contains a bunch of wines under $50 retail, along with 8 wines over $100 and 3 wines over $500, with the plurality of wines falling in the $30-$50 range (11) and under $30 (11), then $50-$100 (10), then $100-180 (5), then over $500 (3). Note that the only 11 under $30 is tied for the most is this breakdown. You'd be hard-pressed to break down the list in a way that didn't have under $30 as the highest category unless it's under $30 and everything else, or $30-$100 or something similar. I think your breakdown is even more relevant after the comment discussion above, where we talked about $30-$50 range wines offering sometimes extraordinary value. I'm doing the multiple posts here to try to keep different subjects in different threads. I can tell you that what surprised us the most about this was not the price of the wines, although we were pleasantly surprised to see so many lower priced wines included, but where they came from. Obviously the Mass. wine is surprising to see, as is the three Portuguese table wines, a Sav. Blanc from Chile (the only one picked), a white from Corsica, a red from Campania, a red from Veneto, a red from Bierzo, this is what people sent in as their most memorable wine. Now obviously the location may have made it more memorable than another Burgundy (we had those too) or Riesling (plenty of those, we were relieved we didn't get 10 Rieslings) or Chianti or some other wine from the world's "super" regions. So to us the big takeaway here is something that isn't surprising when you think about it, but that wine professionals are into a completely different wine world than most consumers. There are not great wines at any price range. You get what you pay for! Sure there may be a handful of wines that are nice under 20 and maybe a few more under 30 but the reality is for a wine professional, a consumer with a good palate, someone passionate about wine with a good amount of tasting experience, etc. the number of wines you'd have to taste to find something truly memorable under $20 far outweighs the benefit. Also, more than likely you would not want to just drink that wine over and over again. Are there dogs out there at all price ranges? Sure but the number of wines you have to taste that cost over $50 to find something excellent is considerably less than you'd have to taste to find something under $20 of the same or close quality. That makes sense for a number of reasons – not least of which is that the field of wines available to taste in those price ranges I'm sure is proportionately less as you move up the tiers of price. I think in a way, though, a higher price tag also comes with a much higher set of expectations, which of course also plays for/against that wine's "memorableness." Let us not forget the 'elephant in the room' here. That $97 average in a restaurant represents a wine that is about $30 at retail. That puts it in range for at least a 'splurge' from most serious wine drinkers. In this economy, drinking fine wine at home and skipping the 300% markup seems a smart play. P.S. If a wine costs $500+, it better be memorable! "Well, it would be a great buy at $27, and since it's restaurant only I'll say $40." Wine list sez…. $40, on the nose! Just to point out, these are retail prices. We use retail because restaurant markups and wholesale prices can vary so widely, and retail is much easier for us to get our hands on. So, although I know this is going to feed the "overpriced" wine narrative, you'd be paying more than $97 on average for these wines in a restaurant setting. How much more is so varied that it's impossible to say, although the hyperbolic 300% markup is probably higher than what the average (and especially the median :)) would be.